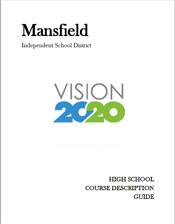 Current year course description guides and graduation requirements (including the recommended graduation plan, the distinguished achievement program and minimum graduation program) for Mansfield ISD students. **An Endorsement is a coherent sequence of courses for four or more credits which includes one advanced course in the designated area of study. Students complete the Foundation Plan with an Endorsement (26 credits). Algebra II must be one of the math courses. To be eligible for the state’s top 10% Automatic Admission in to colleges and universities, students must complete the Distinguished Level of Achievement. Students and families are strongly encouraged to research the entrance requirements of each potential college and university of interest.